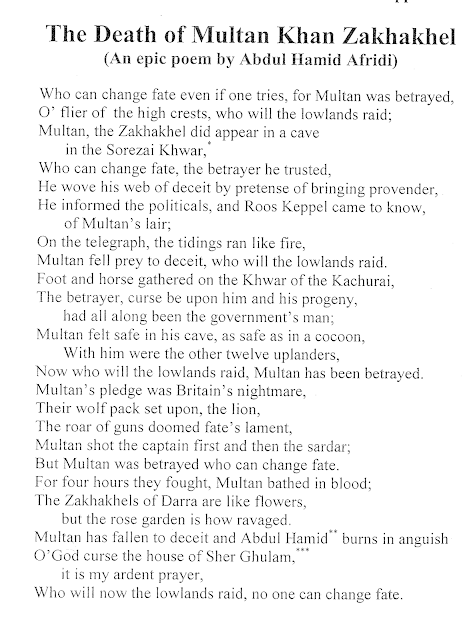 Multan Khan, Anai Zakha Khel of Tirah, was a marauder, 'Paladin' and a hero of the anti-British locals of Peshawar valley. He was a tall and handsome Afridi , who had served as a Sepoy in the 26th Punjab regiment , and therefore was well versed in platoon level tactics, which he used with effect for escape and evasion and in deceiving the Police. In the meantime there was trouble brewing in the Afridi country between the British government and the tribes. On 13th February 1908, the British forces under the command of Maj.General Sir J.Willcocks attacked the Zakha Khel area in which the British forces suffered severe losses . 40 men were wounded or killed including a British Major. With this attack of the British , Mullah Syed Akbar Aka Khel, or known as Dadar Mullah, a Mullah of the Qambar Khels, , and Qazi Mir Haider , openly joined hands with Multan Khan. 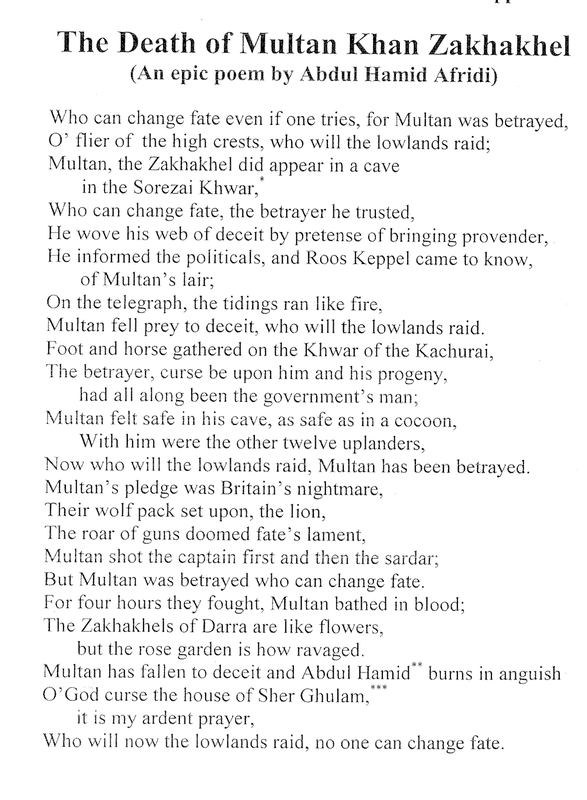 Multan Khan Afridi continued his incessant attacks on border outposts and doggedly harassed the British. 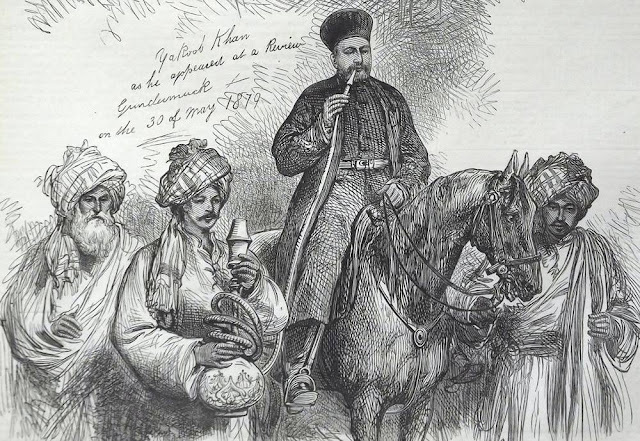 In one such fracas, he was seriously wounded and took refuge in Jalalabad , from where he sent a letter to the British , saying that he wanted to return back and also extended an invitation to the authorities to arrest him. The British kept the Border Military Police on full alert. Like this for years, he had ridiculed all the precautions taken by the British. In December of 1908, Multan and his followers, dressed in Police uniform , went to Aman Kot (Pabbi) and looted a Hindu house. In 1909, with the help of a paid informant, Sher Ghulam, the British finally brought Multan to bay and killed him. Six of his men were arrested at Sorezai, Peshawar. Sher Ghulam was awarded ten thousands Rupees in cash by the Political Agent Khyber Agency. But he did not enjoy his reward money. The Afridi as a tribe were roused in anger for his act of treachery. They burnt down his house , and later he was killed by one of Multan Khan's relative. 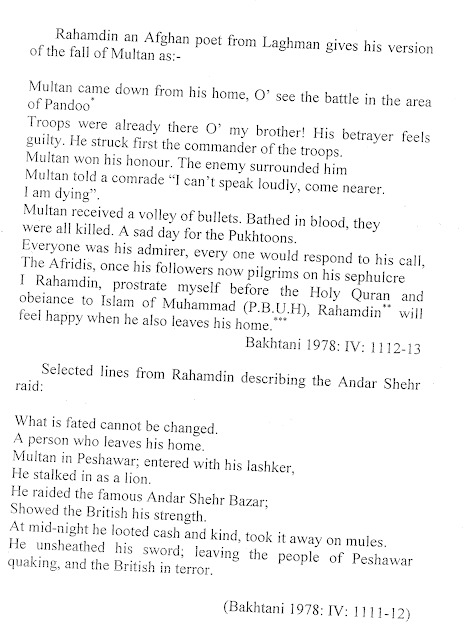 legends of Multan's deeds of derring do today form a part of the Afridi folklore.